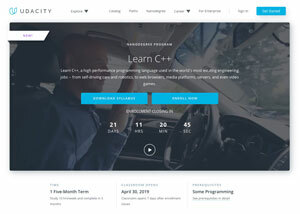 Udacity is launching a new Nanodegree program on the foundations of C++, the programming language used to code self-driving cars, robotics and other complex autonomous and artificial intelligence software systems. Designed for software engineers with intermediate programming knowledge, the five-month program covers fundamentals and advanced skills in object-oriented programming memory management and concurrency, according to the company. Student will learn practical C++ skills through hands-on projects, programming exercises, videos and quizzes. They will build a portfolio through five real-world projects: building an OpenStreetMap route planner; building a system monitor using object-oriented programming; building smart pointers; building a chatbot; and, as a capstone project, building a C++ application. Students will also have access to a number of support services, including project reviews from Udacity's reviewer network, help from Udacity mentors, career services and a student networking community. The C++ Nanodegree Program costs $999; the deadline for enrollment is April 23. More information is available on the Udacity blog.